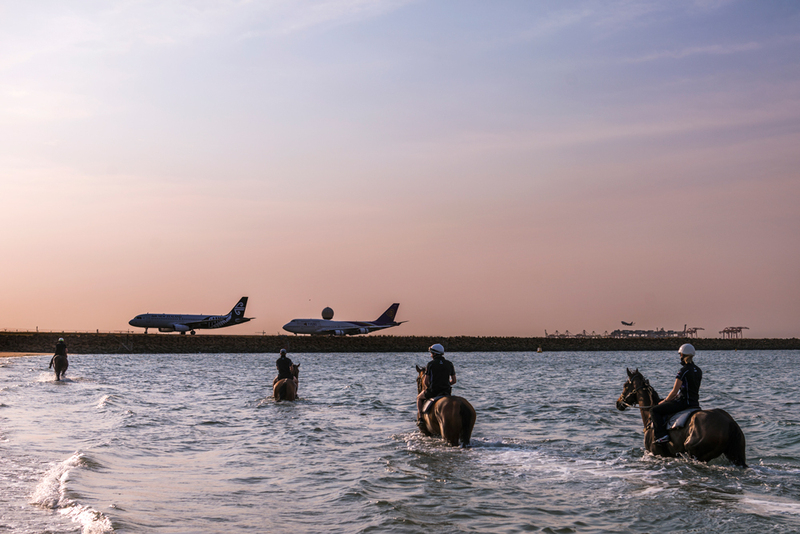 A racing team takes their horses for a swim early in the morning near Kingsford Smith Airport. Photography by Matthew Abbott / Oculi. You won’t find this unnamed beach in the Lonely Planet, but it’s a good one. 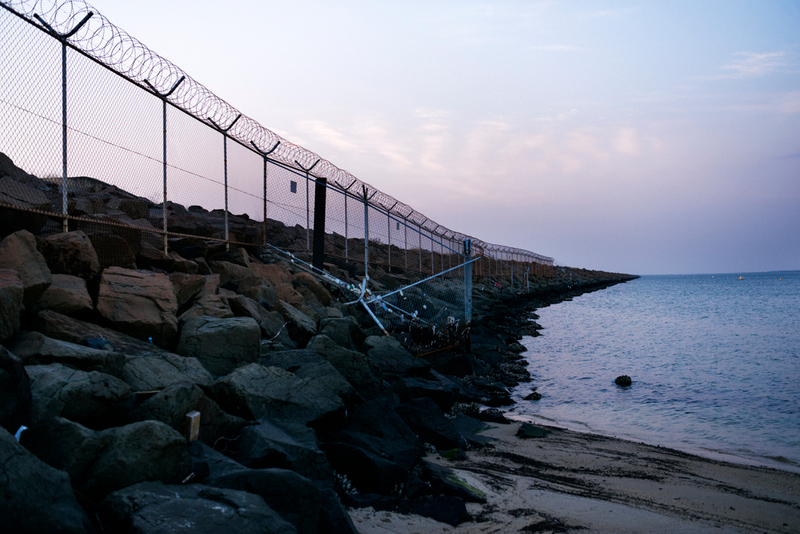 Wedged between the north-south runway at Kingsford Smith and the M1 to Canberra, it’s protected by dunes and scrub with gently sloping sand out into Botany Bay. 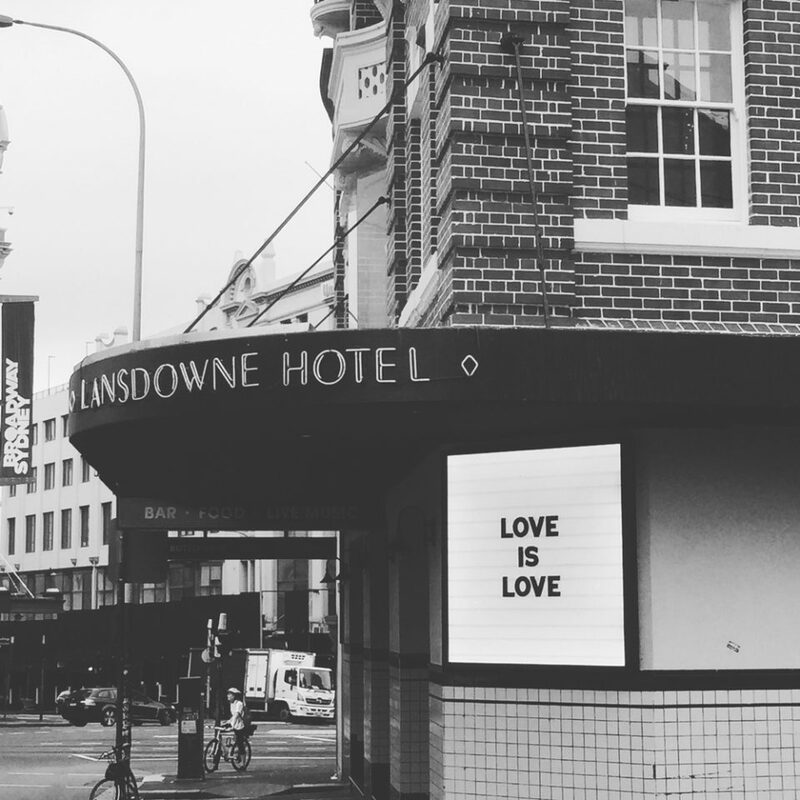 There’s no surf lifesaving club, no English backpackers, no ice cream truck. Just a couple of dog walkers, someone having a sneaky durrie and half a dozen horses. 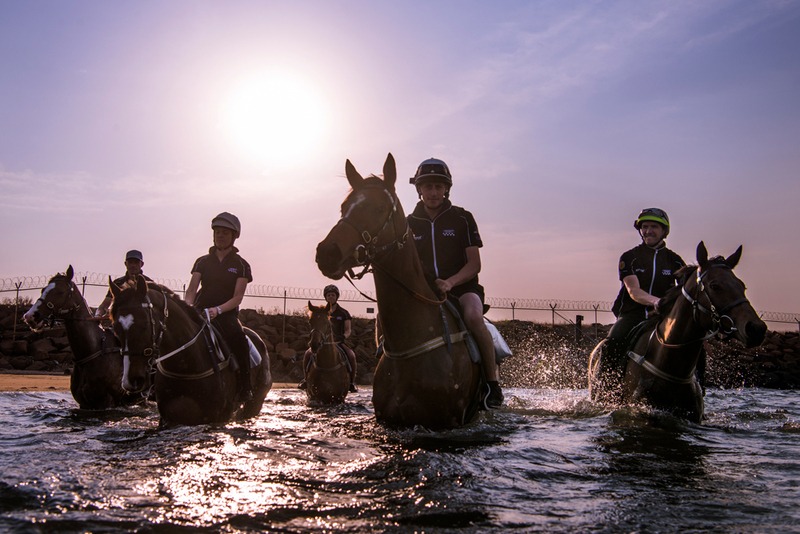 The horses have been trucked in to use the cold water of the ocean to speed up muscle recovery from sessions on the track. They’ve done tests up at the uni to show how it works and no-one can find any evidence, but Gai Waterhouse swears by it, so people do it. Anyway, how many champions have you seen a scientist train? Horses used to be ridden down to the calm surf at Coogee, to get in a session while the Bunnies and Swans were tucked up in bed. But that’s stopped now. There are no horse-friendly beaches left in the city. It’s another one of those endearing quirks that Sydney has WHS’ed away. Beach workouts with League or AFL players attract attention. People pull their phones out and there is an occasional Carn the Dogs! But today, the only interest is from one of those over-happy poodle crosses who gets called away before she can even get a sniff. Maybe it’s the wrong audience, or maybe it’s just that these horses don’t look much like celebrities. All shades of bay. All fit with lean flanks and sprinter’s hindquarters. And although yesterday’s grooming is holding, there’s no silk. 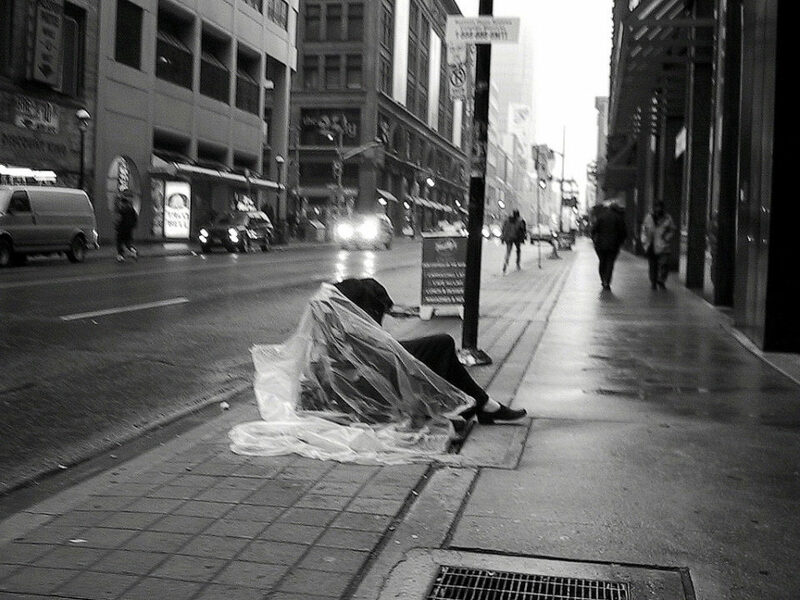 No colour. The black paint on their hooves is scuffed. There are no clues that there might be a champion among them. The horses look around without much interest, there’s nothing to eat and compared to the rowdy crowd at Rosehill, the A380s and Airbuses aren’t worth their attention. The mood is pretty low key. The truckie chucks manure from the float under a convenient bush (no dinky bags and discrete bins here), while the riders fuss with the horses affectionately. The only person who follows them down to the water is the truckie, who has stripped down to his undies for the occasion. He’s got a little gut and the elastic band announces from his waist: Bonds Bonds Bonds. Before anyone has a chance to chide him, he bounds ahead through the surf and belly flops on a small wave. The riders shake their heads. The horses ignore him. It takes skill to mount a horse without a saddle and the riders do it elegantly, grabbing a handful of mane and swinging themselves up with an easy, fluid movement. There’s no starter and no stewards to get them organised. It’s just a day at the beach on a bright Sydney morning. The riders are unhurried and the horses are too. They’re away. The pace is steady as they head out into the bay and one of the horses takes a moment to splash herself, beating the water with her hoof. A furlong from shore the water is deep enough that the horses can’t easily push off from the sand and one by one the riders slip into the ocean so they are hanging upside down like an acrobat under their horses’ necks. Together they plough deeper into the sea. On land the rider is master and the horse is servant. But in the water with the rider up front like a bowsprit, with their feet on their mount’s chest, they look much more as one; it’s almost intimate. And because their faces are barely ten centimetres apart, it’s a little unclear who is leading who. Yes, the rider has the reins, but only the horse can see where they are going. There is something touching about watching them together. It takes a minute or two for them to get their confidence and for their timing and tempo to come together. 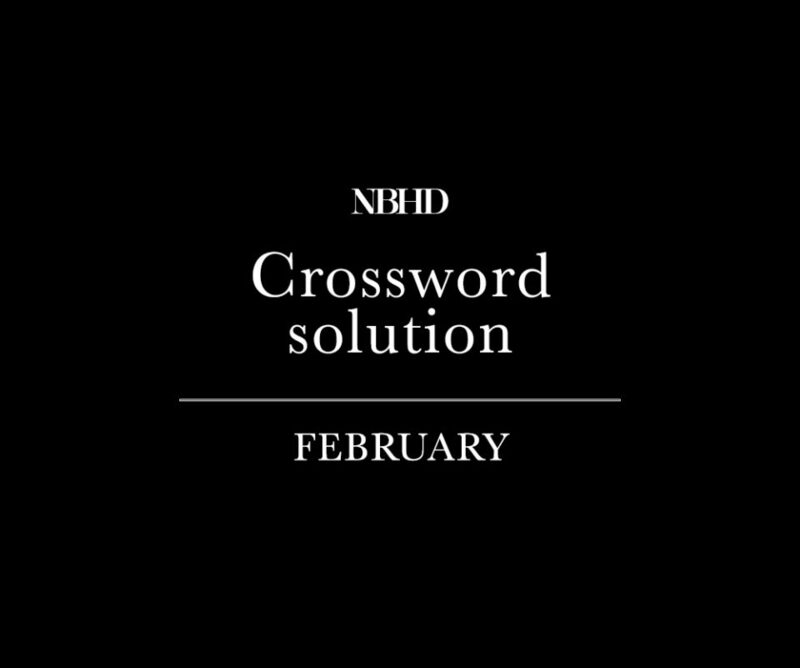 But when it does, it creates a flowing rhythm that is transmitted through the forequarters of the horse to the rider, so it looks like they are dancing out there. Dancing through the dappled water on this fine morning. It’s fragile too; movement is holding them together, buoying them up. So they can’t stop this thing they have started, horse and rider, rider and horse. Gliding, surging through the bay. Gracefully out of their element. After ten minutes, one of the riders lets go of their reins. The spell is broken. They head for the shore. In a last act of trust, each rider grabs a handful of tail and they’re dragged in until they can touch the bottom. 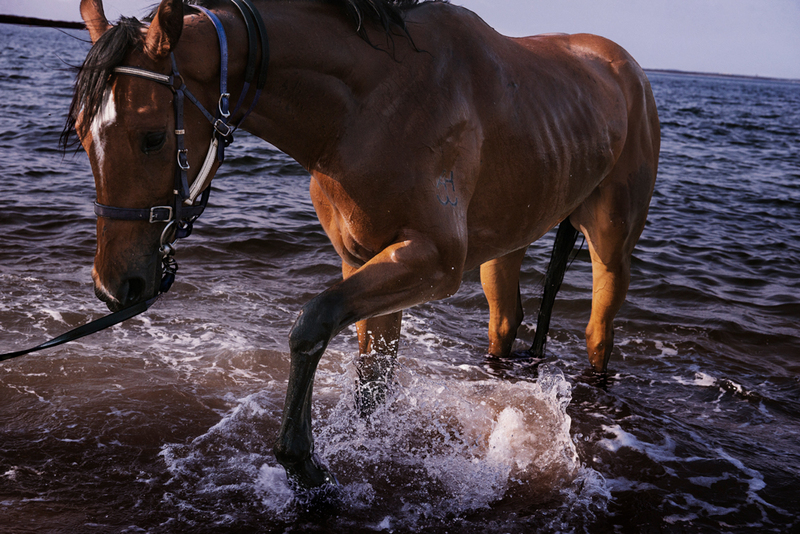 Up out of the surf the horses screw their eyes and flick their ears to get rid of the salt water. Then, with an air of immense concentration, they lower themselves onto the sand for a roll. Once they’ve got everything scratched, they haul themselves onto their feet grunting. And then they stand there, looking surprised at the world, dusted like doughnuts. A quick brushdown, horses loaded and it’s back to the stables for the routine of the racing week. The riders and horses go together in the float so it’s just the truckie up front, flashing a grin to the bay as he drives out. And why wouldn’t he? 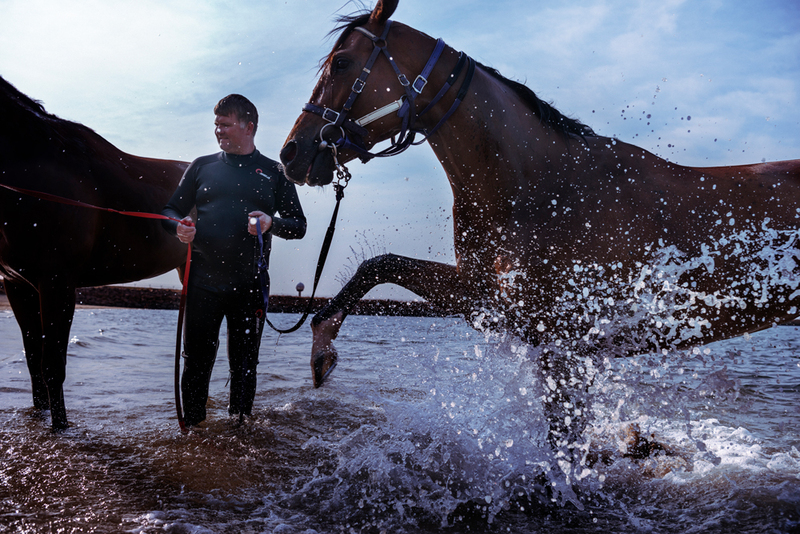 He’s just been paid double time to have a swim with Winx.